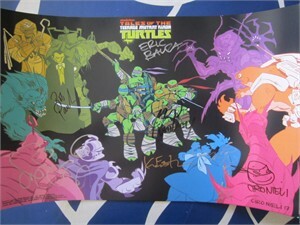 Roughly 11 by 17 inch mini heavy paper promo poster for the hit Nickelodeon TV show Teenage Mutant Ninja Turtles autographed in various pens by creator Kevin Eastman, artist Stan Sakai, executive producer Ciro Nieli and voice actors Rob Paulsen (Donatello), Greg Cipes (Michelangelo), Eric Bauza (Tiger Claw) and Yuki Matsuzaki (Miyamoto) for a total of 7 signatures. 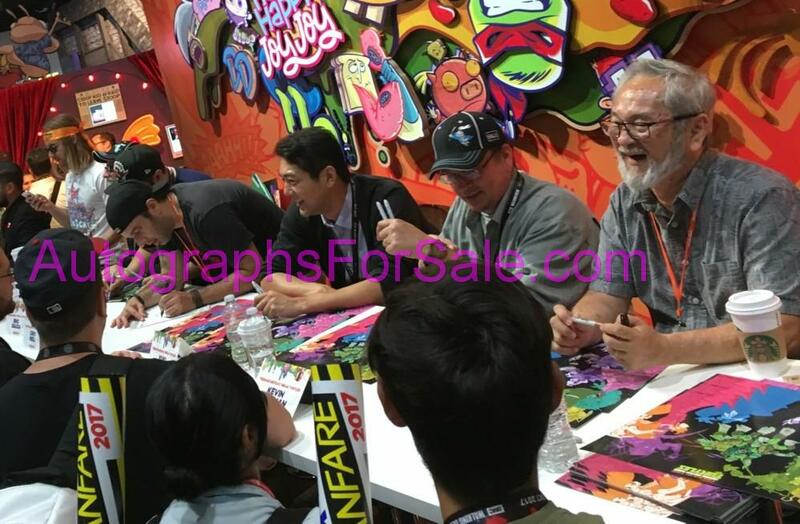 Obtained in person at limited 2017 San Diego Comic-Con signing. PERFECT MINT CONDITION. With certificate of authenticity from AutographsForSale.com, photo from the signing and original Nickelodeon signing ticket. ONLY 3 AVAILABLE FOR SALE.